Did you know that the Schooner Western Union was built to maintain the communication between Floridian cities, the Caribbean islands, and South America? She was launched in 1939 by Herbert Arch of Thompson Enterprises. 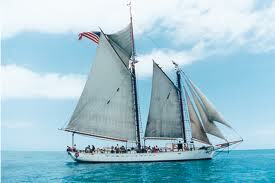 She was constructed with a hull of Cayman mahogany and planking of Longleaf yellow pine from Florida. She ended up being leased to the Western Union Telegraph Company and was used to maintain signal cables between Key West and Cuba from 1939 to 1974! She sure served a long time! The coral reefs here in Key West give so very much to residents and tourists alike! We are provided with an abundance of fish and other marine life as food sources. We also get to observe coral reefs firsthand through glass bottom boats, snorkeling, and scuba diving. But our activities of fun and play can greatly damage marine life around our coastline, especially our coral reefs. So when you’re enjoying the beauty of the world and our beloved Key West around you, remember to be careful… don’t touch the reefs because the oil from human hands can greatly damage them and be mindful of your flippers! We thank you from the bottom of our hearts… as does the ocean! We hold the world in the palm of our hands by our actions! Act with consideration to our home! Posted in Key West | Comments Off on Help Protect Our Reefs! You are currently browsing the Old Town Trolley Tours Blog blog archives for June, 2014.